When the Edward Snowden story broke this summer, I quickly realized The Good Wife was gonna have a field day with it. For once, it wouldn’t be the first TV show to tackle a current event—Scandal aired an NSA surveillance episode before Snowden even happened, because it has clairvoyant powers. But the Snowden story had everything The Good Wife loves—it revolved around technology, it went into weird pockets of the law—and it only took two episodes for us to dive right in. Man, this was a complicated episode, huh? When almost every phone call happens, we cut to an NSA office where two operatives (played by Zach Woods and Tobias Segal) are listening in. The goals of the NSA are amorphous, and overseen by a tired-looking higher-up played by Michael Kostroff (Maurice Levy of The Wire). It’s originally to do with Lockhart/Gardner representing Marwat back in season three, but now maybe it’s to do with ChumHum. Or maybe it’s to do with Zack’s ex-girlfriend Nisa and her weird family connections. Or maybe it’s do with the Governor-elect. What the episode does masterfully is present how easily shocking decisions can be made at the NSA. What it’s doing seems terrible vague and illegal. But the decision-making is so compartmentalized, and the scope of investigation so vast, that pretty much anything can be listened to for any reason. Most of it is ignored, of course, and Woods and Segal could care less about all the innuendo they hear regarding Alicia and Cary’s plans to break away. But it’s still frightening stuff, and the banality of everything that’s happening makes it all terrifyingly plausible. The specifics of the case were a little much for this sleepy reviewer. I am consistently impressed at the complex legalese The Good Wife spews at its viewers, knowing they’ll keep pace through sheer enthusiasm, even if some of the details are beyond them. We bring back Jeffrey Tambor (who had such a good time last week and keeps that streak alive here) for the case of the week, ChumHum suing the NSA for a gag order it’s been issued over NSA surveillance of ChumHum data. I think. My head hurts a little bit just typing all that out. CHUMHUM! God, The Good Wife likes wheeling out John Benjamin Hickey as Neil Gross, the catch-all tech CEO wundergenuis megajerk who wears jeans and frowns at everyone, but in a cool way. CHUMHUM. I’ll never get over the name ChumHum. It’s the most ludicrous fake tech name The Good Wife or any television show ever dreamed up. Except for maybe SleuthWang, the Facebook substitute invented by Patric Edelstein (Jack Carpenter), who also appeared this week. Just kidding, I know it’s not called SleuthWang. It’s SleuthWay. I think. So, there’s a lot of talk about the NSA and ChumHum and a lot of legal wrangling that’s somewhat entertaining to watch. The most amusing twist is when the NSA says only the judge can see the evidence it’s entering because of security reasons, and Tambor leaves the court to look at it, comes back, and says Alicia’s side loses, without giving her a chance to rebut. It’s another absurd piece of legal craziness that totally happens, and The Good Wife exploits it nicely. Otherwise, the case is a little too bogged down in technical twists and turns, although the closing verdict, where ChumHum wins a nominal sum, but can intimate that it won big because of another gag order, is clever stuff. ChumHum serves another purpose this week—it is to Cary and Alicia as Lucky Strike was to Sterling Cooper Draper Pryce. Without it, the two don’t have a law firm, and they’re living on the edge as they get their ducks in a row, their offices rented and so on. I’m a little impatient for the split to just happen already. I can deal with a few episodes of set-up, but I hope this doesn’t get stretched out for, say, 13. The Good Wife impressed me with this big twist last year, but that included the assumption that it would actually happen. I want to see what Florrick/Agos will look like. Another twist dangling from last year that gets picked up is Diane’s nomination to the Illinois Supreme Court. The Chief Justice makes noise at Peter about her appointment, the firm’s history with Lemond Bishop, and Will’s suspension. Eli calls him a sexist, but apparently, this poses a threat. The show is already ignoring the actual procedure of the court (where judges are elected from the state’s five districts), so it’s impossible to know how plausible it is that his objections would derail Diane’s candidacy. Whatever. Diane is told to throw Will under the bus to the press to get her judgeship. She initially refuses, then she falls in line. It’s the dumbest part of the episode because she does it just as Peter puts his foot down and says she doesn’t need to. When that was the closing shot of the episode, I groaned. But I’m still intrigued as to how this will all play out. It’s tough to see Diane joining the bench unless she’s being written out of the show or getting a spinoff. 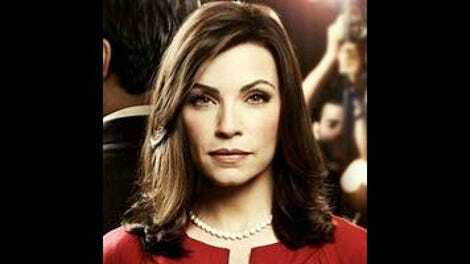 But The Good Wife does some remarkable things with its characters. Stockard Channing stops by as Veronica and gets good and drunk with her daughter, Alicia. And also gives her $140,000. And also flirts mercilessly with David Lee. Busy day! Dreama Walker also comes back as the conniving Becca, who’s been gone ever since Don’t Trust The B In Apartment 23 was a thing. Nice to have you back, even if your gavel-stealing plot felt totally irrelevant! ChumHum. Oh, it’s just fun to say.